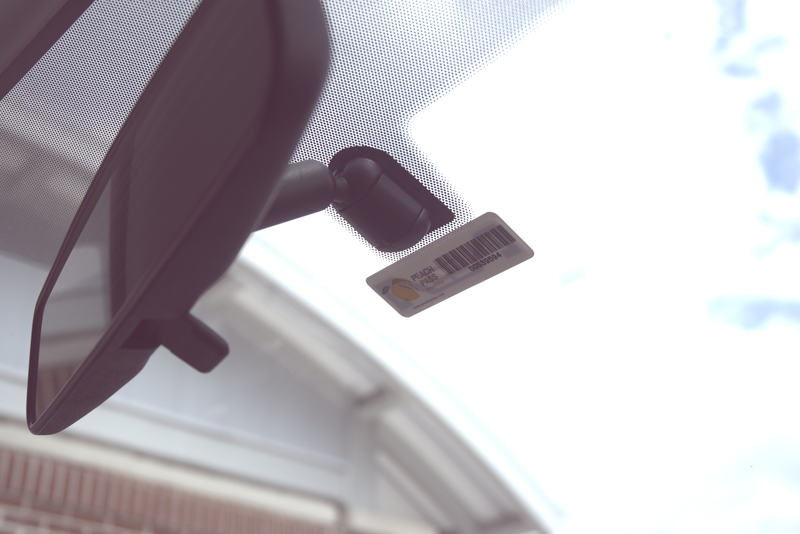 Each vehicle in a household must have a properly installed Peach Pass transponder to ensure accurate toll transactions on the Georgia Express Lanes. How do I install a Peach Pass in my vehicle? Your Peach Pass must be permanently installed on the inside, center of your windshield before driving on the Georgia Express Lanes. Allow 3/4 inch from the center of the mirror and 2 inches from the top of the windshield. If you have another type of tag on your windshield, it must be at least 2 inches away from the Peach Pass. Install the Peach Pass when the windshield’s temperature is above 50°F (10°C). If necessary, use your heater/defroster to warm the windshield before installing the Peach Pass. Note: Metallized windshields require a bumper mount Peach Pass rather than the standard windshield tag to ensure accurate toll readings. The bumper mount should be adhered or bolted to your front bumper (depending on the type of transponder) using the pre-drilled holes that are meant to hold a front license plate. If your vehicle does not have pre-drilled holes, brackets may be provided by your dealership or found at an auto parts store. To get a Peach Pass bumper mount, please call the Customer Service Center at 1-855-PCH-PASS (724-7277).